Here are eight great inspirational quotes to lift you up when you are down. 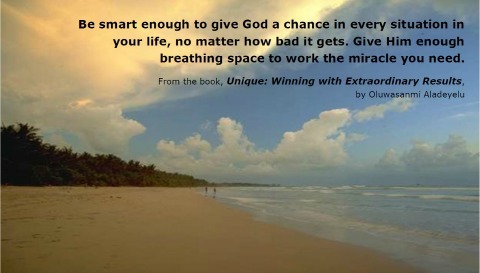 All the quotes were taken from the book, Unique: Winning with Extraordinary Results (author: Oluwasanmi Aladeyelu; editor: Ursula Lang). In your weariest moments, may they strengthen you to ride through the storms of life and stand on mountains. May they encourage you to attain your highest aspirations. "Sometimes our first reaction is fear when God is actually helping us to triumph over our problems. Storms do come into our life but they are there only to showcase the majesty of God." "No matter what happens to you, it’s not over yet if God hasn’t said it is. The world may crumble and your walls may fall apart, but it surely cannot be over if God hasn’t declared it to be so! Instead of running around in panic, you should put your mind and your heart together in faith and start seeking the Master." "Beyond every blow, there is a smile and, beyond every devil you come across in life, there is God. "Give every blow you get a 'but': I am broke but I am getting rich as soon as I am done with being broke; I am sick but I am getting a clean bill of health as soon as I am done with being sick, as soon as I get through to God." "Be smart enough to give God a chance in every situation in your life, no matter how bad it gets. Give Him enough breathing space to work the miracle you need." "Get positively desperate before God. He will get that addiction out of that man. He will separate that child from drugs and every wrong influence. He will break those bad habits and dissolve that harmful relationship. All you need to do is to get God on the job of touching and working on their hearts." "Until we decide to do the unthinkable - that which everyone else scoffs at - we may never break into the unimaginable that will amaze the world." "God has created everyone with the potential to accomplish great deeds; all we need is to 'just do it'."